Another scorching hot day for the President’s match, once again between the Refreshers and Joe Cannon’s Arcadian Casuals at Marlborough College. 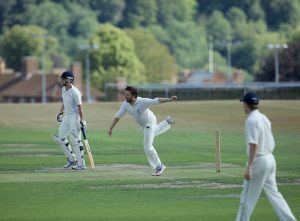 The Marlborough groundsman had prepared a beautiful, hard and slightly green track in the middle of the square and the Refreshers, having won the toss, had no hesitation in batting. 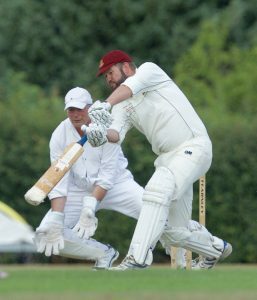 The Casuals’ opening attack, however (Voodoo Stevens and Horse Callcutt – both erstwhile Refreshers), was quick and straight and three fairly quick wickets left us at 34 for 3 (Dumont, Tatton–Brown and Sir Jonathan Cohen). Harry Spurr stuck around on his way to an elegant 50 and when Leo Buscombe joined him we pushed on to about 110 for 3 at lunch. After an excellent lunch lasting an hour or more, we resumed, aiming for 250; Leo ended with 87, trapped lbw by Cannon, Charlie Covell scored 54 and Richard Warlow with some other minor contributions took us to 242 for 8 declared by 4pm (after 43 overs). The Casuals needed nearly six an over, and had some good batting, but we took regular wickets and had them 3 down by tea. 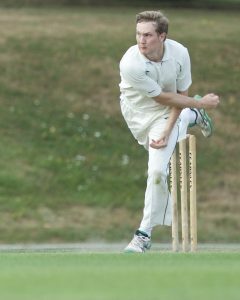 Warlow (2 for) and Leo (5 for) bowled well; we also bowled Spurr, Freddie Nevill, Simon Davenport, Hugh Sutton and the President. The Casuals continued to attack the target but equally kept losing wickets and by the close – following a flinty stand by the aforesaid Voodoo and Horse – had reached 205 for 8 (off 39 overs) as Dumont took a smart stumping off the President’s bowling with the last ball of the day! An honourable and exciting draw, both sides claiming the moral victory. 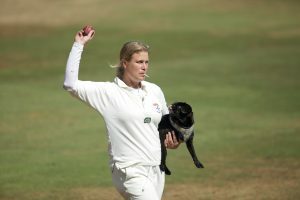 All in all it was a wonderful day; memories linger of Leo’s innings, Tom Cayford’s drone filming us from the air, Rachel’s dog mounting a number of pitch invasions, Tom Gold’s firm umpiring and a strong appreciation that this was how cricket should be played. A couple of beers outside the pavilion in the evening sunshine were followed by dinner for about 14 chez Pres (with the 2009 Ormes de Pez) and a barbecue for the Casuals at their weekend billet near Oare.